In a large skillet heat oil...add in the smoked sausage and cook, turning often till browned on edges. 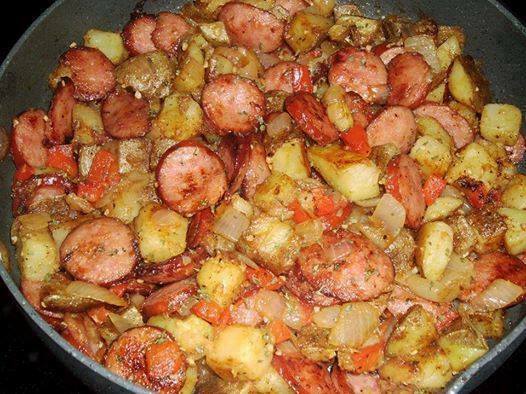 Remove meat from skillet and add in the potatoes and cook over med. high heat till they begin to brown and become tender. Add in the onions, pepper and garlic cooking for about 5 minutes then add in the chicken stock and cover. Cook for about 5-6 minutes, stirring occasionally. Remove cover and check potatoes for doneness. Add the spices, stir and add in the smoked sausage.